This week I finished my 8 week trek through the Bible on audio, covering 220 chapters which took about 14 hours and 10 minutes. I had attempted an 8 week challenge a few years ago, only to be thwarted a few weeks into it with a job change that had me working at home. Was it worth it? Absolutely. The panorama of Scripture that this kind of exercise affords is marvelous. And the unrelenting immersion, which can often be difficult, was worth the effort. By the way, there’s nothing magical about 8 weeks (40 work days). When I calculated my average commute time to the length of the audio recording, it just happened to match 40 days. I hope to do this again before the year is over. From Jesus marveling at the unbelief in his home town to the widow’s offering. From the wedding at Cana to Paul bidding a final farewell to the Ephesus church. From Paul setting sail for Jerusalem to Paul admonishing Timothy to fight the good fight of faith. From guarding the deposit entrusted to us to a call for Christians to persevere. This week I covered 138 chapters at almost 9 hours, ending slightly behind my estimate which had me in Luke, though only by 4 chapters. From a lament for Egypt to the sealing up of the Words of prophecy until the end. From Hosea’s wife and children to a prophecy of Israel’s restoration. From the prophetic command to rebuild the temple to Jesus feeding 4000. From the Pharisees demanding signs to Jesus healing Jarius’ daughter. This was another slower week that required more reading. But I managed to cover 120 chapters of the prophets at about 8 hours and 20 minutes. One of the striking aspects of reading through the prophets is the contrast between the kindness and severity of God. The image of God that prevails in our current Christian culture is an emasculated God of simplistic personal love who has no depth, like a flat, cliched character in a bad story. In contrast, the God revealed in the prophets not only is a God of wrath (on a corporate and individualistic level), full of severity, his love is far more transcendent than the love drivel we hear from the contemporary church. I like what D. A. Carson says about God’s love. He says God is love, but love does not define the totality of God. Spent my commute reading some materials for a project. From a plea for Gods grace to God proclaiming disaster for the unrepentant nation. From the looming disaster of Jerusalem to the coming new covenant. Jeremiah buys a field during a seige to Jeremiah’s pray that God restores his people to himself. From Ezekiel’s vision at the Chebar Canal to a prophecy against Egypt. This week was one of my slowest, covering 185 chapters at almost 7 hours. I’ve been reading some material for my job, and my iPhone has made it possible for me to do that on the bus. I’ve been reading numerous PDF documents as well as a couple of books via the fabulous Kindle application, along with Stanza. I’ve been doing this since starting 8WTB, but this week had the most reading. From a psalm about the Lord surrounding his people to the pressing of anger produces strife. From an oracle about Damascus to complacent women warned of coming disaster. This week I covered 168 chapters at about 8 hours and ten minutes. So far I”m right on target with my estimate, being in the Psalms at the end of week 4. From David anointed King to Jehoshaphat’s reign. From Jehoshaphat’s alliance with Ahab to the exiles guilt of intermarriage. Nehemiah’s prayer to rebuild Jerusalem’s walls to Job’s answer to his first foolish counselor Eliphaz. Job’s answer that life is hard and harsh to Elihu rebuking Job’s three friends. I worked from home one day this week, and also had a few other messages to listen to, but managed to listen through 86 chapters at about 7 hours and 10 minutes. Worked from home — no commute. This week I got through 119 chapters, at almost 9 hours. From the Lord appointing Joshua to succeed Moses when he dies to the Lord promising to raise up another prophet like Moses. From instructions for cities of refuge to the dividing of the land of Canaan among the tribes at Shiloh. From God instructing Joshua to establish cities of refuge to Ehud suppressing the Moabites bringing 80 years of peace to Israel. From the song of Deborah and Barak to Hannah giving birth to Samuel. From the Lord calling Samuel to David sparing Saul’s life a second time in Gibeah. Genesis 1 to Genesis 36. From Creation to Jacob meeting Esau settling in Shechem and the generations of Esau. From Joseph being sold to the Ishmaelites, to God preparing Moses for the last plague. From the institution of the passover and final plague to the construction of the tent of meeting. From the building of the ark and furnishings of the tabernacle to the Day of At0nement. Yesteday I began my 8 week trek through the ESV Listener’s Bible. Rather than give daily updates, I’ll post a summary of my progress at the end of each work week. This is not to gloat, but rather to encourage others to do the same. I listen to a lot of sermons and interviews on audio, and given that appetite, I think it only fitting that I channel that appetite to an audio reading of Holy Writ. It’s to my shame that I haven’t done this more often. 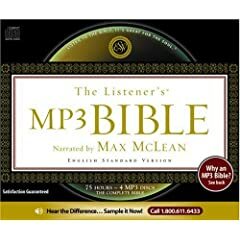 Beginning next week I will be starting an 8 week trek through my favorite audio Bible, Max McLean’s Listener’s Bible in ESV. There are 1186 chapters, and McLean’s Bible audio version is almost 75 hours long. Over 8 weeks this breaks down to roughly 9 hours 20 minutes per week, 1 hour 50 minutes per day, which means 55 minutes each commute. That easily fits into my 1 hour 15 minute commute. There’s nothing quite like immersing yourself in the spoken word for an intense duration. The picture of God’s Word that emerges is priceless. I encourage you to join me on this trek.